i made this the other night, and let me tell you, it was balls to the wall awesome. never made risotto? never fear – it’s not nearly as complicated as it might seem. i adapted this recipe to my liking, which meant adding more rice, more wine, and skipping the mussels. what can i say? seafood’s not my style (though i can holler at shrimp from time to time!). 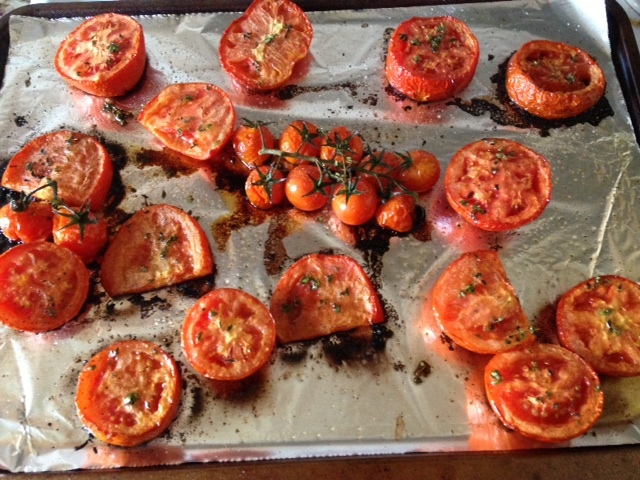 roasted tomatoes with thyme, however…that is my style. big time. there’s nothing like the sound of freshly sliced tomatoes hissing and popping in your oven (sidenote, i just accidentally wrote “pooping” instead of popping!). every time you hear that crackle, you know there’s some sweet tomato-y goodness coming your way. the wonderful thing about risotto is that once you’ve got the base recipe down, the dish is endlessly customizable. i’ve made beet risotto, mushroom risotto, asparagus and sweet pea with lemon risotto…you really can put just about any flavor into this creamy rice and it’ll be irresistibly delicious. i’d actually never made tomato risotto before, but after eating it the other night, i’m pretty sure i’ll be adding this recipe to my regular rotation. one of the things i love most about risotto is that it forces you to relax. the dish requires constant attention on the stovetop, so you can’t do anything but stir. and drink wine, and chat with friends, or listen to music, or let your mind drift. there’s no multitasking, no, “i should prep my lunch while this cooks” or “i could be cleaning the bathroom right now” (these are legitimate thoughts i have, by the way). all you can do is stir, and breathe, and let me tell you, you want to breathe, because onions sweated in butter and salt and pepper smell incredible. so, let’s get cooking, shall we? *start by roasting your tomatoes. slice the big ones, leave the little ones be. spread them out on a baking sheet and drizzle with olive oil, then sprinkle with salt, pepper, and thyme. add a few sprigs of thyme onto the sheet as well – they’ll infuse the tomatoes with extra deliciousness. bake at 350 for 25-45 minutes (mine took almost 50; every oven is different). you’ll hear the tomatoes pop and sizzle as they cook. you want them to look wilted, but not too smushy, when they come out. the image above is a good indicator of what you’re going for. set aside 1/4 of your roasted tomatoes in a bowl. you’ll use them later. now, blend or food process the remaining 3/4 of the tomatoes until they resemble a thick soup. you’ll be stirring this goodness into your risotto in a bit. set aside. put your stock onto a second burner and heat thoroughly. you’ll use the stock to cook the rice. to make the risotto itself, put your diced onion and your butter into a large saucepan. cook on medium heat for about 5 minutes, until the onions have sweated, the butter has melted, and the kitchen smells like your favorite italian restaurant. now, add your rice. cook for about a minute, until the rice turns clear and the pan begins to crisp. dump in your 1/2 cup of wine (feel free to add more, the alcohol burns off anyway) and stir. scrape the bottom with a wooden spoon as you stir to fully deglaze the pan and get all those delicious little browned butter bits up. add about two ladles-full of chicken stock (though you can use veggie if you’d like to make this recipe vegetarian) into your rice, and stir. turn the heat down to low, and leave it there. for the next twenty minutes, you are a slave to your stove. all you need to do is stir, add more stock, stir, add more stock, and so on and so forth, until your rice is cooked all the way through, and your risotto is a beautiful creamy texture. again, this should take about 20-25 minutes. if you don’t use all your stock, don’t worry! once your rice is done, mix in about 1/2-3/4 of freshly grated parmesan cheese. mmm, cheesy. now, take your blended roasted tomatoes, and mix those in as well. now, your risotto should be creamy, cheese, and a beautiful tomato red. go ahead, stick your spoon in and have a taste. hallelujah, it’s delicious, isn’t it? now, take those tomatoes you reserved earlier, and stir them in as well. if the pieces are too big, feel free to cut them into bite sized bits first. dole out into soup bowls or small pasta bowls. this should serve around 4-5 people for dinner. sprinkle a bit of parm on the top, and garnish with a small sprig of thyme. et voila, a delicious dinner!